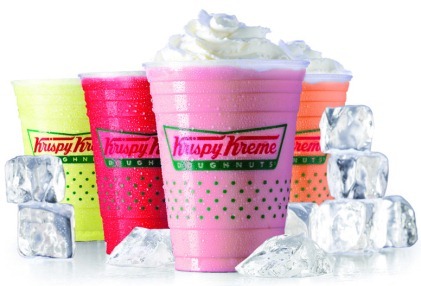 Winston-Salem, N.C. (June 18, 2012) Give your taste buds a chill this summer with the refreshingly sweet, tart and tangy tastes of frozen Krispy Kreme Chillers®. Made with real lemons, new Frozen Lemonade and Frozen Cherry Lemonade top off seven fruity and KREMEY thirst-quenching blended beverage flavors. Available at participating Krispy Kreme US and Canada locations. FRUITY Chillers Flavors Include: products and availability may vary by market. · Frozen Lemonade- A fresh twist on a summer classic. Made with real lemons, sweetened with only cane sugar and served icy cold. · Frozen Cherry- A chilly treat bursting with bold cherry flavor. · Frozen Cherry Lemonade- A frozen combination of summertime sweet and tangy fruit flavors. · Very Berry – The perfect balance of sweet and tart berry flavors. · Orange You Glad®- A citrusy, refreshing blend of tangerine, mandarin and navel orange flavors. KREMEY Chillers Flavors Include: products and availability may vary by market. · Berries and KREME™- The rich taste of berries blended with KREME and topped with whipped cream. · Oranges and KREME™- A Kremey blend of tangerine, mandarin and navel orange flavors with a whipped cream topping. Frozen Krispy Kreme Chillers are available through the summer at participating Krispy Kreme US and Canada shops. Products may vary by market. While supplies last. Post your Happy 75th Birthday message on a virtual Birthday Card, interact with the Time Machine of Joy, and share your sweetest Krispy Kreme memories atCelebrateKrispyKreme.com. Connect with Krispy Kreme at krispykreme.com, KrispyKreme.com/HotLightApp ,Facebook, foursquare and Twitter, and KrispyKremeDoughnuts on YouTube.